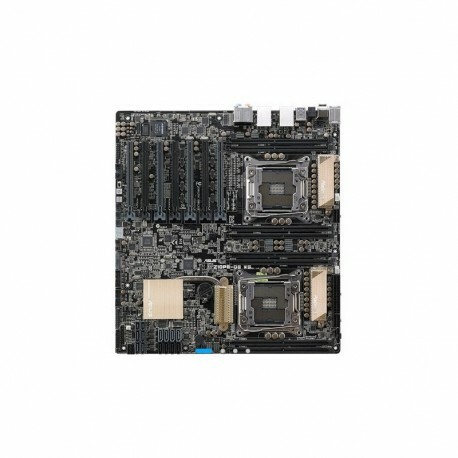 Seven native PCI Express 3.0 x16 slots mean Z10PE-D8 WS is equipped for immense graphics-processing power, so it’s perfect for use in professional fields such as mechanical, architectural, interior design, aeronautics, audio and video design. The ample graphics potential also opens Z10PE-D8 WS to run even the most demanding PC games in full detail — so it’s great for work or play. ASUS Z10PE-D8 WS couples innovative thinking with premium components to deliver industry-leading power efficiency. Carefully engineered with Beat Thermal Chokes II made of highly conductive and efficient design for minimal-loss power delivery and integrated Dr. MOS MOSFET that both saves space and reduces operating temperatures. For the latest workstation motherboard, ASUS introduce the industry's most durable 12K solid capacitors, and exclusive ASUS ProCool power connectors. Z10PE-D8 WS is built to stay cool under pressure — and boosts performance, power efficiency and product longevity into extreme levels! Q-Code logger is your one-touch checker that lets users easily check system status at any time. Plug a flash drive into adjacent USB port, press the motherboard's dedicated Q-Code logger button and all ASUS Q-Code event logs for the current live session will be copied to the drive even with the system off. As the Z10PE-D8 WS is meant for professional users who rely on non-stop operation, stable power delivery is critical. Real time power supply health detection helps prevent sudden system shutdown and provides hassle-free notifications should power delivery be insufficient. Additionally, LED messages on the board clearly indicate any relevant power issues in the event your system fails to boot. SATA Express provides up to 10Gbit/s data-transfer speeds from two PCIE 2.0 lanes, resolving the higher bandwidth request in the near future. The current SSDs consume up to 550MB/s, which is close to saturation point for SATA 6Gbit/s connections. Backwardly compatible with up to two SATA drives, SATA Express is the next-generation connectivity standard — and ensures that you and your system won't get left behind. With two native PCI Express 2.0 bandwidth, M.2 supports up to 10Gbit/s data-transfer speeds and up to 22110 NGFF. It is the perfect choice for an operating system drive, making your whole PC work that much faster. Z10PE-D8 WS packs advanced features onto a standard Enterprise Electronics Bay (EEB) form factor to deliver superior flexibility and performance, with dual Intel® Xeon® E5-2600 v3 sockets, eight DDR4 DIMM slots, and seven PCI Express 3.0 x16 slots. Z10PE-D8 WS also has ten USB 3.0 ports, eight SATA 6Gbit/s and two of the latest SATA Express connectors — so you’ll benefit from data transfers of up to 16Gbit/s! It also offers superb multimedia, with 7.1-channel DTS-HD® Master Audio output.